It’s a fact that the majority of solar PV system owners manage to use around a quarter to a third of their generated electricity, with the remainder being exported to the electricity grid. 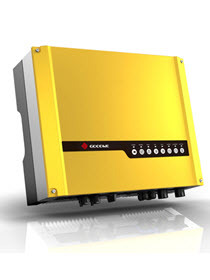 The inverter manufacturer Goodwe addresses this with its ES range of hybrid inverters. During periods when the output from the solar panels exceeds demand, the surplus is used to charge batteries which can then be called upon to provide power when demand is higher. The hybrid range comprises the 3648ES, which is a 3.6kW unit, and a larger 5048ES which is rated at 4.6kW. Both are compatible with batteries from a range of manufacturers including LG, Hoppecke and Pylon. Both lead-based and lithium-based battery types are supported. Click here to see a case study of a Goodwe hybrid installation.